New product, Collection, combines video with product links to drive conversions. Beginning Thursday, Facebook is rolling out a new mobile shopping ad format globally, along with a new metric to measure the number of outbound clicks each ad receives. Known as Collection, the format consists of a photo or video set above four clickable product images. The images can be arranged automatically based on Facebook data or manually by the brand. The new format is meant to help marketers drive product discovery and sales, said Maz Sharafi, director of product marketing at Facebook. "Mobile influence in commerce is exploding," he said. "People are increasingly expecting fast-loading, seamless, compelling experiences on mobile, and ‘Collection’ enables marketers to drive product discovery details through an engaging format." Facebook has found that 45 percent of all shopping includes some type of mobile action, he added. Similar to Facebook’s Canvas ad format, Collection takes users who click through to a full-screen display within Facebook that showcases up to 50 products sorted by relevance to the user. These products come from the catalog advertisers upload onto Facebook. Sharafi said the experience "enables the consumer to do some browsing before clicking off to one of the individual products and going into the advertiser’s website or app." Facebook will also be testing a new metric in the coming weeks so marketers can see how many people move from the display. The platform is calling it an outbound click metric that specifically measures the number of clicks leading people off of Facebook. Measurement issues have been top of mind for the company since it was revealed six months ago that it had been overstating video metrics. "Our hope is to offer marketers a clearer picture of how people pass through the entire creative experience for these immersive formats," said Sharafi. However, the metric will not provide the specific links that people click off to. The new ad format also works to continue Facebook’s push to get advertisers to place more video ads on mobile, said Sharafi. Last week, Facebook began a global campaign to show marketers that they can use videos on mobile to make emotional connections with consumers. When it comes to shopping, the platform sees the shift to video as being just as big as the shift to mobile, if not bigger, according to Sharafi. "We're seeing a rise of video in driving shopping behavior," he said. "Three out of four consumers say that watching video on social media influences their purchase decisions." Still, the new Collection format won’t take priority over other ad formats within a mobile News Feed, he said. 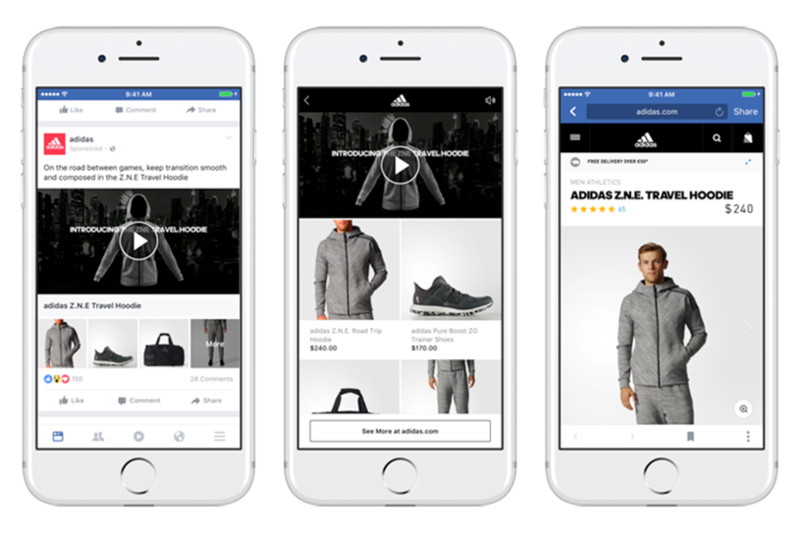 For the past few months, Facebook has partnered with Adidas, Tommy Hilfiger, Michael Kors, Cartier, Sport Chek and Lowe’s to test the ad product. So far, these brands are reporting positive results. Adidas saw 5.3 times its return on ad spend and 1.8 times decrease in cost-per-conversion, according to Rebecca Watts, performance marketing senior specialist at Adidas. The brand found that Collection is especially helpful when it comes to cross-selling products. In the format’s main focus point, the brand featured its new Z.N.E. Road Trip hoodie in a video that highlighted its technical features. Beneath the video, Adidas placed similar products in order to cross-sell. "Collection has outstanding cross-selling capabilities," said Watts in the blog post, "and we’ll certainly explore this new format again to inspire and increase sales." Tommy Hilfiger also saw a significant return on ad spend. Last fall, the brand used it to transform a runway video into a mobile shopping experience where users could buy exactly what the model was wearing. This led to a 2.2 times higher return on ad spend and 200 percent increase in return on investment, according to Avery Baker, chief brand officer at Tommy Hilfiger. Similarly, Cartier saw two times return on ad spend when it used the format to drive fine jewelry sales for Valentine’s Day. Brands like Sport Chek saw an increase in online sales. The brand used Collection to feature holiday apparel, and saw a two-times lift in conversion and 28 percent increase in online sales. It’s not just online sales that have seen improvement. Lowe’s used Collection to drive people into its stores over the holiday season. According to Facebook, it drove over 600 percent more in-store conversions.